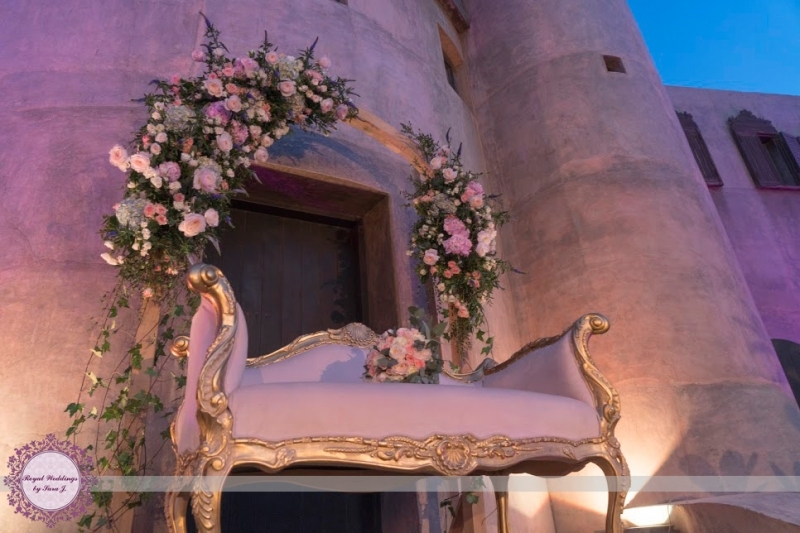 With a degree in Interior Architecture, and experience in the fields of architecture, interior design, and event management,our founder, Sara J, decided to form Royal Weddings by Sara J. Help with finding, negotiating, and booking suitable vendors. We will schedule appointments and accompany clients to the scheduled meetings with the appointed vendors. Upon selection of the service providers, we will be the main liaison between the client and selected vendors. 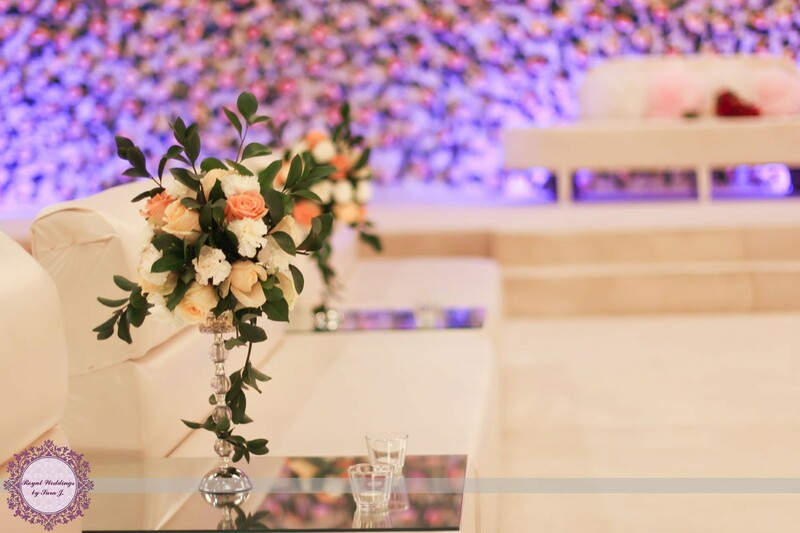 Form a concept and theme, color scheme, stage design, lighting design, layout plan, centerpieces, aisle design, wedding favors, invitation design, and more upon request. 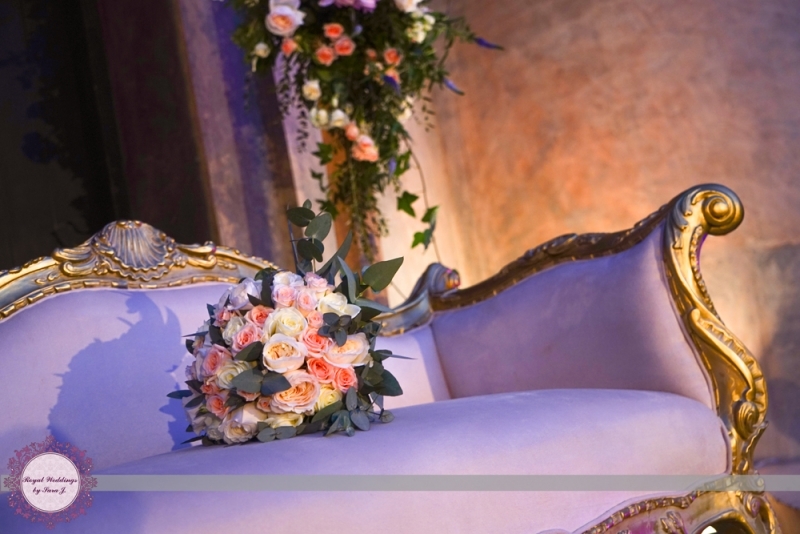 On the day, we provide wedding day coordination on-site,supervision of ceremony, set-up & venue inspection, liaise with the couple & family & vendors, itinerary/logistic management, briefing venue & service staff of the wedding agenda, and more. A Royal Weddings Event "Forever After" is a Gatsby themed wedding. 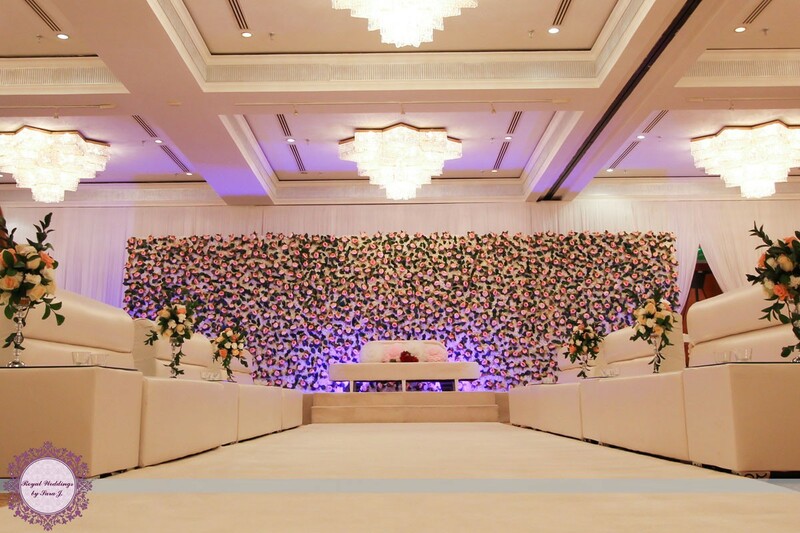 Upon initially meeting the bride, we set a theme for the event. Since the couple are from our neighboring Saudi Arabia, it was our job to provide a full A-Z consultation. Based on the selected theme, we explored different stage designs to accentuate our color scheme and theme. 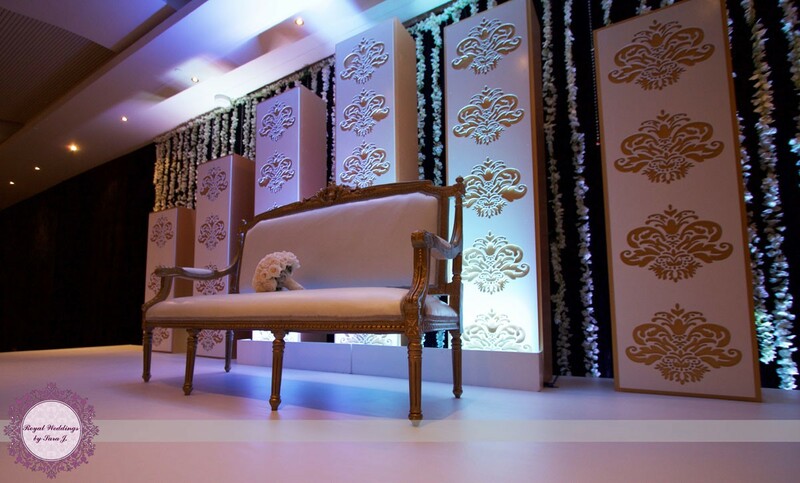 We created gold and white pillars with lavish patterned cutouts, with velvet black drapes in the background to give a dramatic effect to the colors and pillars. Additionally, Gatsby themes are well-known for the accessories used, so we created accessorized centerpieces, mixing flowers, feathers, pearls, and gold candelabras. Moreover, with the request of the couple, we custom designed a photo booth along with festive photo-props adding to the wedding's vast variety of guest entertainment. 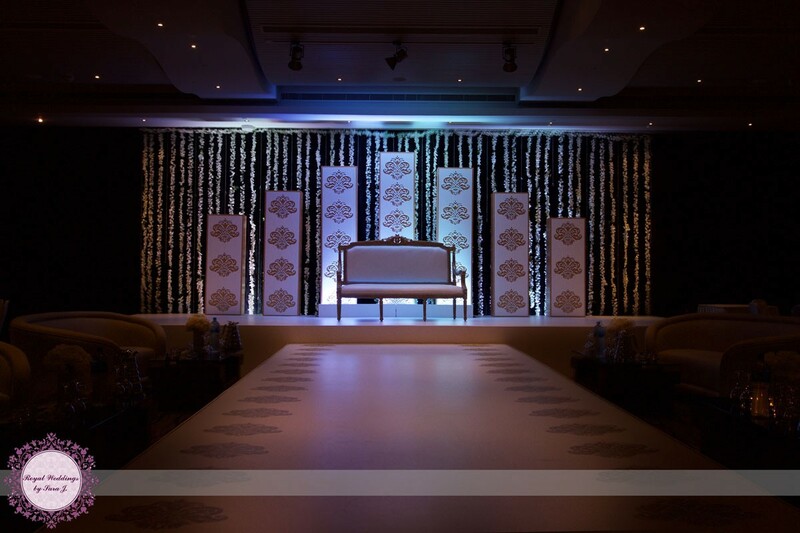 Finally, we selected LED lighting and candle mixes creating a dramatic and lavish Gatsby wedding. 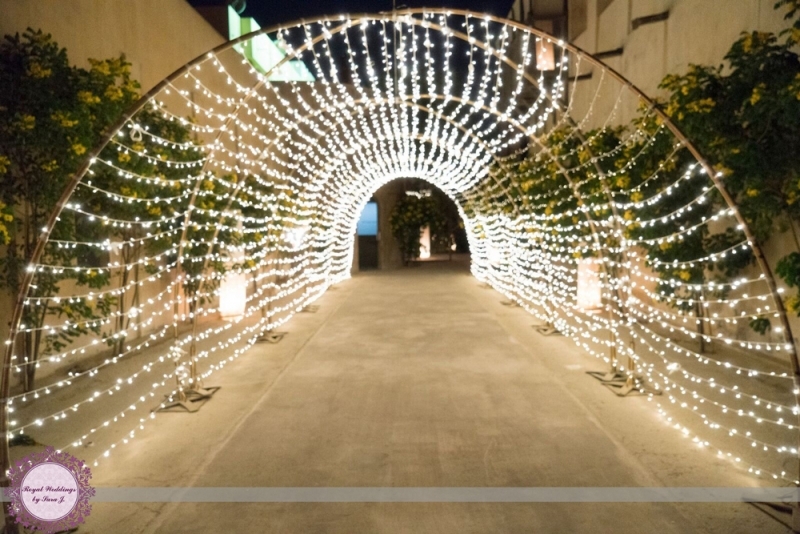 A Royal Weddings Event "A Starry Night" Wedding event is a rustic themed outdoor wedding. 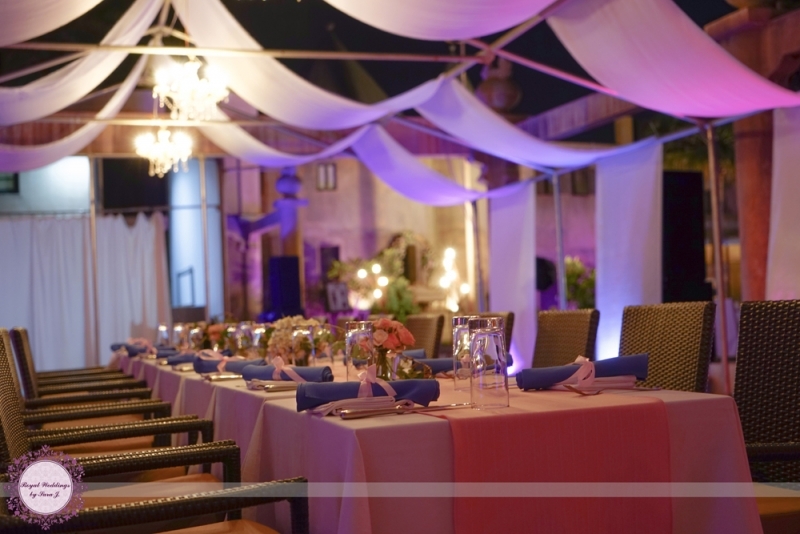 Upon initially meeting the bride, we set a theme for the event. Since the couple are from our neighboring Saudi Arabia, it was our job to provide a full A-Z consultation. 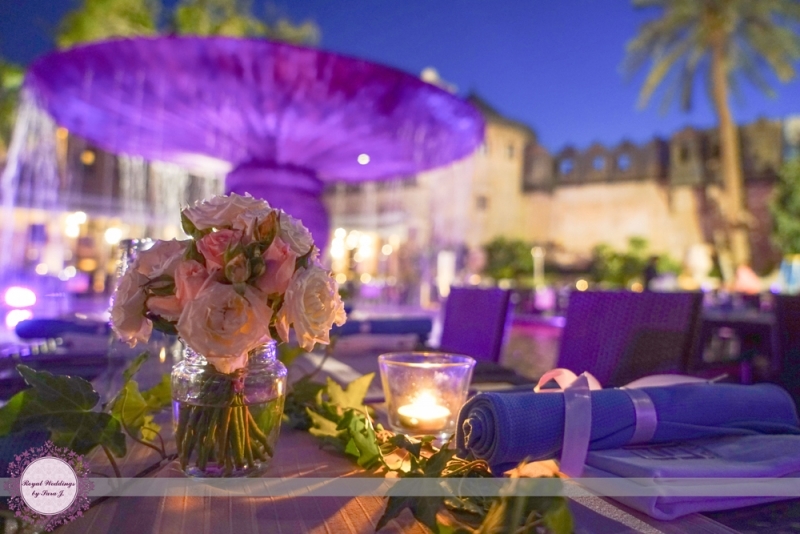 Based on the rustic and outdoor requirements the couple had, we immediately suggested the enchanting La Fontaine as the wedding venue. 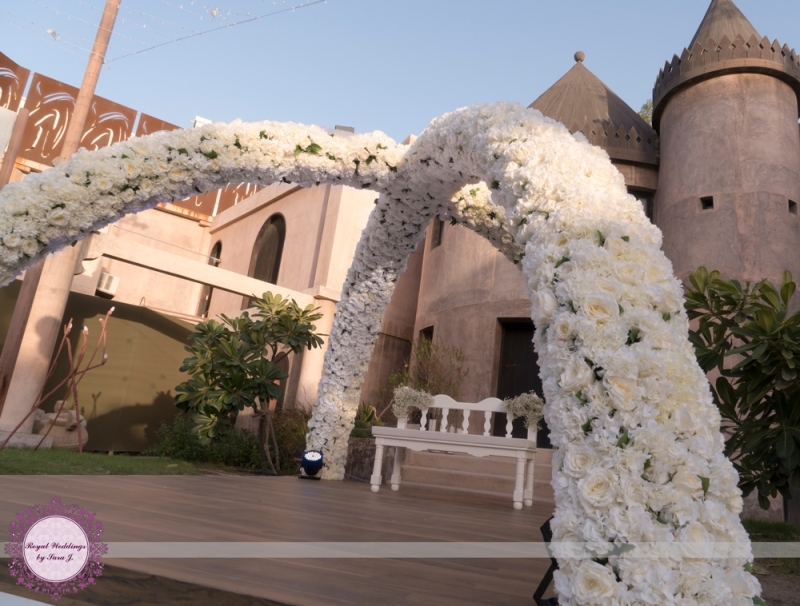 During the design phase, we suggested a cross arch embellished with mixed white flowers and leaves, giving an edgy style to the rustic theme. Moreover, we custom-designed a white "love" bench for the stage. 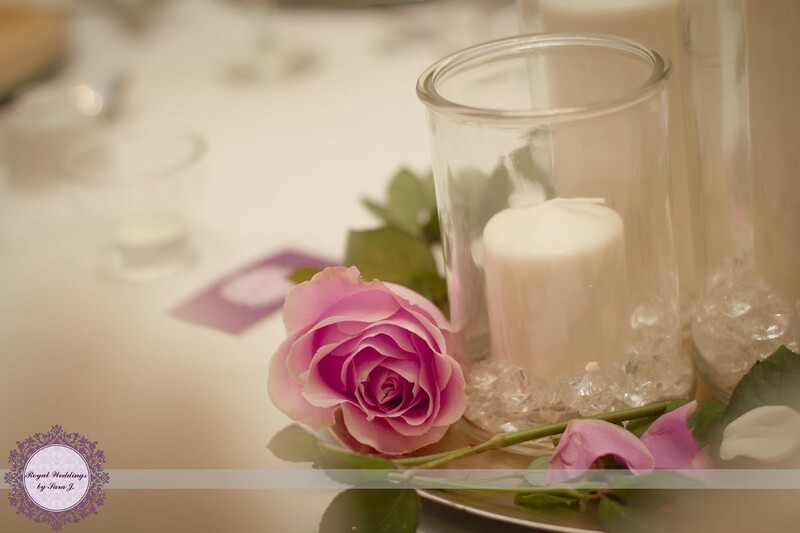 Additionally, baby breathe centerpieces were chosen to complement the theme, along with pillar candles. 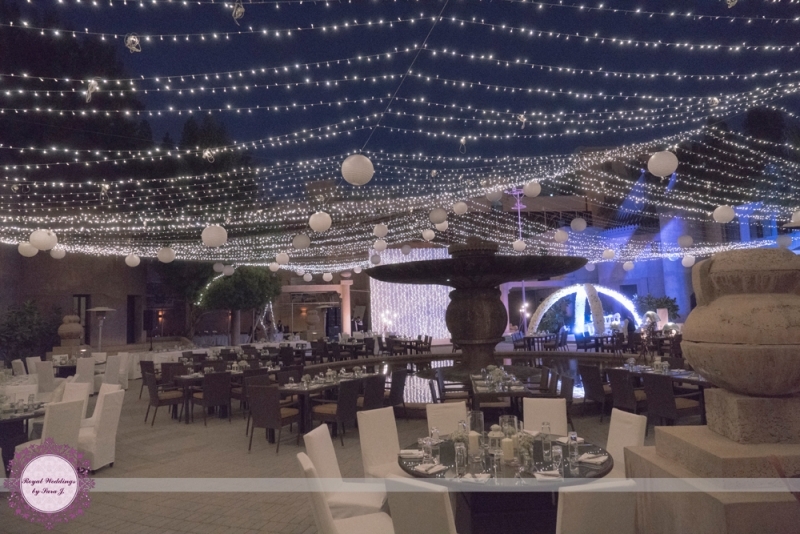 To complete the ambiance, we arranged a full floating cover of fairy-lights and lanterns above the majestic fountain, thus creating a "Starry Night." 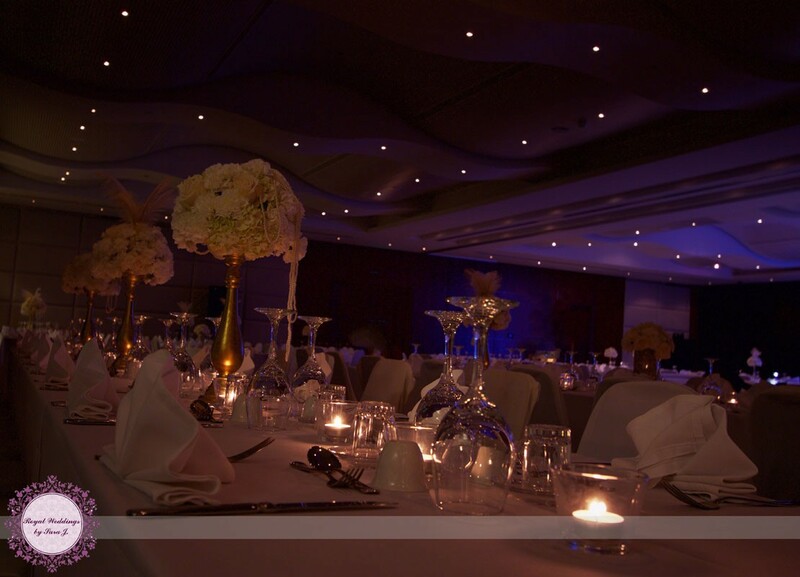 The final touch was to recommend a Saxophonist for the reception, making it a classy affair not to miss.